Tahini Hummus Recipe- the perfect dip! It’s only been recently that I’ve come to appreciate the awesome that is hummus. Now that I’ve started, I want to explore it all. The world of hummus. How, you ask, did this come to be? To start, I never actually liked hummus before. But I’d never really tried homemade hummus and then I was the parent helper at a Cub Scout meeting…we made hummus…I couldn’t encourage the kids to try if I wasn’t going to… and to my shock, I loved it. 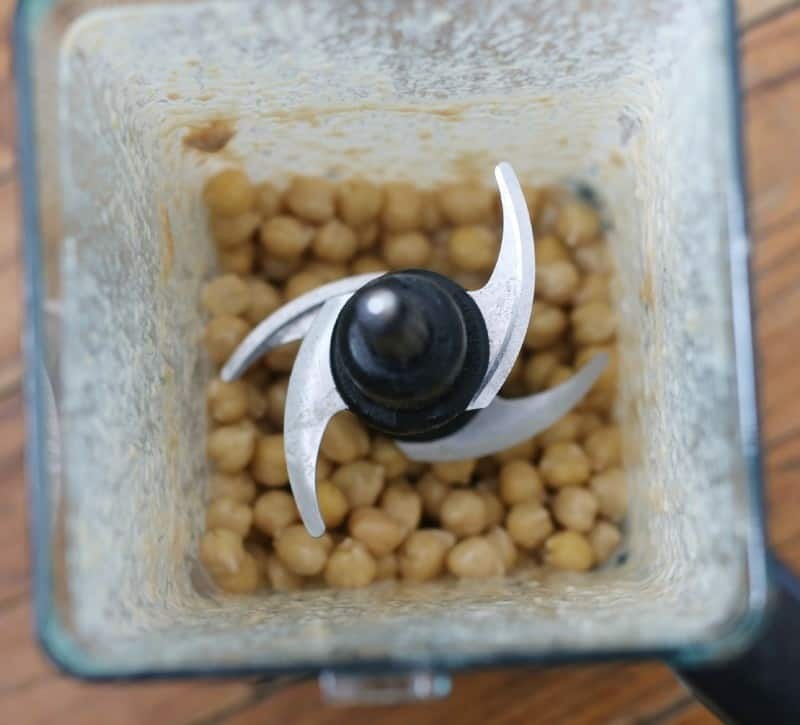 Around here, we call this Cub Scout Hummus, but it’s really a simple tahini hummus. 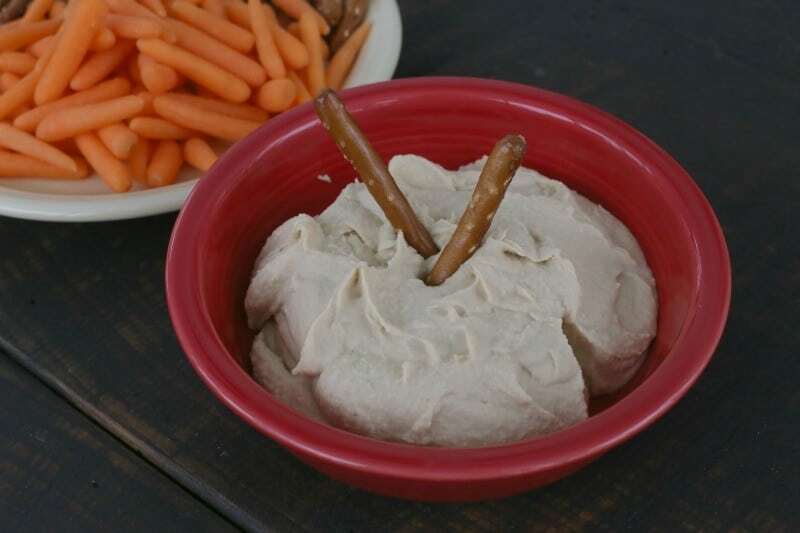 We love it with carrots and pretzels, although pita crackers are pretty great with it too! 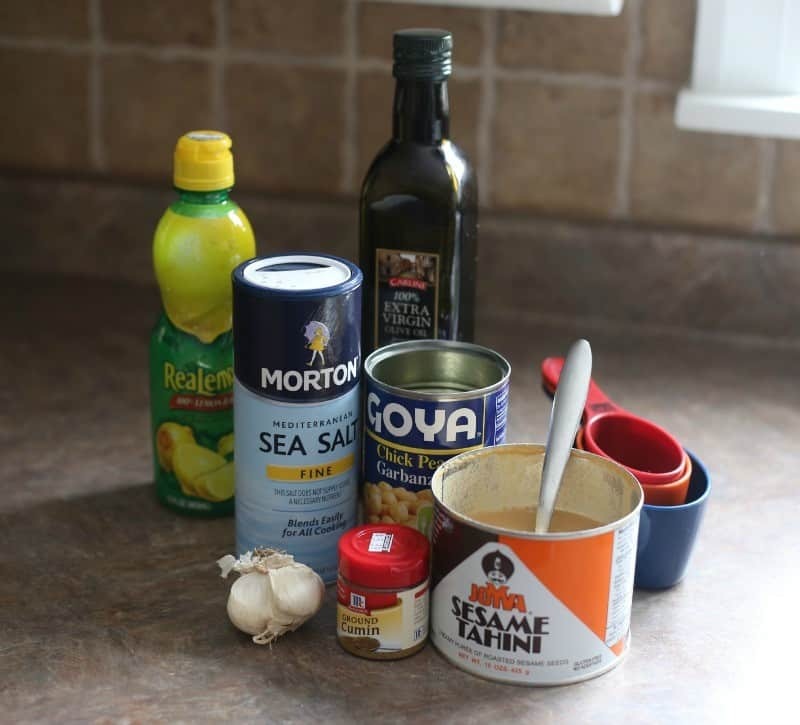 This tahini hummus recipe is brought to you as part of an Ambassador partnership with CansGetYouCooking.com and the MomitForward network. Opinions are my own. Add salt and any additional olive oil to taste. Serve with carrots, pretzels, pita crackers, etc. Canned foods can be a hallmark of a healthy diet. Yes, I’m serious. Hummus is chock full of protein and nutrients- and it’s quick and easy to prepare. Toss some in a little container with some veggies to dip and you’ve got yourself a super-healthy snack to keep you going through the day. Chick peas/Garbanzo beans are one staple you will always find in our cantry! People who frequently eat canned foods may have healthier diets than people who don’t. An analysis of NPD data shows that adults and children who ate 6+ canned food items over two weeks were more likely to meet or exceed their recommended daily allowance for 17 essential nutrients than those who ate 1-2 canned food items over the same two-week period. Canned foods play a big role in helping registered dietitians help their clients (and themselves) eat healthy, balanced diets. According to a recent survey, registered dietitians (RDs) rate canned foods as important in helping both themselves (81%) and their clients (89%) to prepare nutritious, convenient and affordable home cooked meals. Still wondering about why canned? 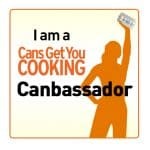 Check out these 4 reasons to eat canned food. We love hummus but, have never made it ourselves! Thanks for sharing at Funtastic Friday! My youngest daughter loves garbanzo beans and she would love this. I too just recently “discovered” hummus and got addicted quickly. Hummus was always so expensive at the store though so I stopped buying it. I plan on using this to make my own so I can resume my obsession! 😉 Thanks for linking up at the delicious dishes recipe party. After finally convincing myself to give hummus a try, I too fell in love! Your recipe sounds quite good! So glad you shared with us at Merry Monday. I love hummus, I just had it for breakfast lol!! I love trying a new recipe and I’d love to try this one! Hummus is so delicious. I still need to get my family on board with eating it. Maybe this recipe will be the key! I’m not a hummus fan (it’s a texture thing) but my other half loves it. This looks like a great recipe that’s easy to put together! I’ve recently gone on a hummus kick and this looks amazing! Can’t wait to make this when my tub runs out. I didnt realize how much I loved Hummus until I tried it at a greek restuarant. I couldn’t get enough. Seriously Brett you have the best recipes. I think my husband would enjoy this hummus. i’ve never liked hummus!! for real! and we make this all the time now. I LOVE hummus! I’ve never made my own but I’m going to try your recipe! my daughter’s favorite new snack is hummus. i will have to make this for her. Oh wow this looks and sounds so tasty! I’ll have to try it out at home! Ok *confession* – would you believe I’ve never tried hummus? But this looks like it’s super easy to make, so I need to give it a shot. Hummus is the only dip I will eat now. It’s really good with gf chips. I haven’t made any yet,but do want to. I have tried hummus a couple times and liked it. I would like to try to make some myself. Your recipe sounds good. This sounds tasty. We love humus – especially with veggies. I haven’t made hummus before. But it sounds a healthy snack to make. I love hummus! It really is so easy to make, too. Yumm. I have never made hummus. I do like it. I am not a big fan of hummus, but my husband loves it. I’ll have to see if he’ll like this recipe. We have a fully stocked cantry. 😉 I like the hummus recipe. That would be great for basketball watching! I love chickpeas. Hummus is my favorite snack. I enjoy peeking at others recipes because it seems everyone makes it a little different. This sounds amazing. Homemade hummus is the best! I would have never guessed that was made with canned beans! I’ve long wanted to try hummus, but the husband always finds a way to put it off. I think I’m going to take this recipe and finally make some! We are all big fans of hummus here. I would love to mix it up a little up & try your tahini hummus. This looks amazing, I love hummus! I love hummus! You have inspired me to make my own! I love a good hummus, I’m going to have to try this recipe out. I love humus. I have a can of Tahini (this same brand) that I have had for a long time, but never made the hummus yet. I hope the can is still good! There’s nothing like homemade hummus! This looks delicious. Oh I’ve never heard of this before! Looks really great. I bet my husband would love this and my girls! My husband loves hummus. Me not so much, but this looks easy enough to make that I’d be happy to make it for him. Thanks for sharing! My daughter makes hummus on a weekly basis. I need to give her this recipe! It sounds really nice. 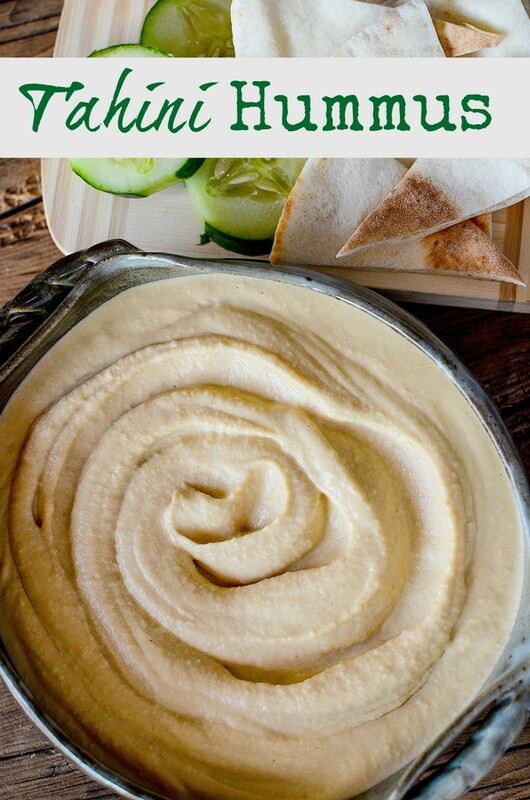 I love hummus and this recipe looks doable and yummy! I have no issue with canned food; I love me some green beans! Well now that you mention it, I’ve never really tried hummus. My family loves it. I will try this recipe! I make my own hummus, but everyone else says it is too garlicy. I like it but after you eat it, you have to stay away from all your friends. I’ll definitely be giving this recipe a try. I love hummus, but I’ve never tried making my own before. It looks really easy. That sounds delicious. I love snacking on hummus on movie night.